This workshop is perfect for someone who has never tried watercolour painting, even if they have never picked up a brush. 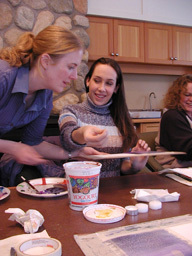 Emphasis will be placed on the techniques and skills needed to develop a foundation of watercolour basics. My approach is light hearted and fun. 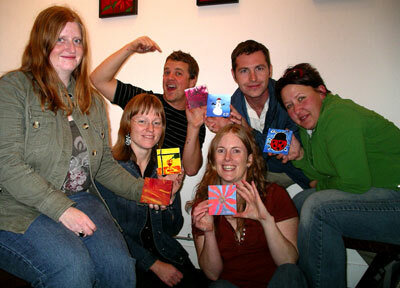 The Kelowna Art Gallery will provide you with a supplies list. This workshop is perfect for those who have dabbled in watercolour and would like to work on their technique and learn some more tricks and tips. "You're one of the best instructor's I've ever had - You're a natural!!" "Kendra your instruction was right on. You're enthusiastic, inspiring, & know how to share your passion. Thank you!!" 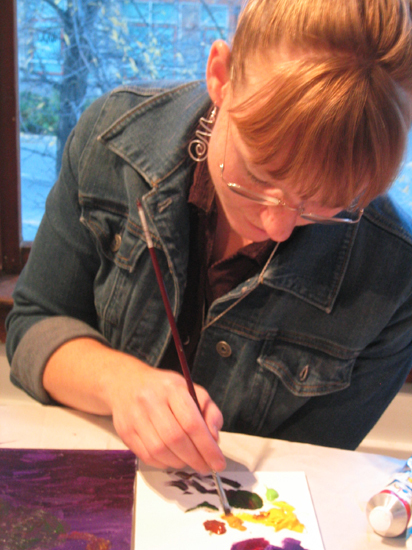 If you are interested in taking a workshop with Kendra, please call her at 250-862-4958. 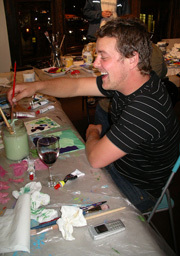 "Please contact me if you are interested in taking a painting lesson. A two hour private lesson is $100 plus HST. This includes any supplies you need to borrow, but I encourage you to bring your own supplies if you have some. Do you have a group of friends who want to take a lesson with you? Call me to arrange a date!" 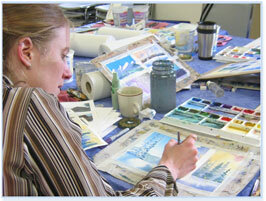 If you are interested in group or private watercolour lessons, please contact Kendra. Above is a demonstration of painting branches on a birch tree and then adding texture by pulling an exacto knife through the wet paint. Tilt the blade on its side and push it into the paper as you pull it along at an angle. The goal isn't to cut the paper, but to squeeze the paint to the edges of the branch, leaving a rough white textured area along the branch. Do this by pressing the edge of the blade into the paper rather than the tip of the blade. In this watercolour demonstration I am painting tree trunks and branches into the wet paint using the handle of the brush. When you press into the painting you create a small dent in the paper and the watercolour paint runs into this valley which causes a dark line to appear. You can also use a knife for this effect, which would make the lines even darker and more obvious because a knife will not only dent the paper but also cut into it slightly which allows even more paint to seep in. Using the back of the brush creates more subtle lines which is nice for a blurry background. You can add salt to the wet watercolour paint to create snowflakes in the sky. When the paper is still damp, sprinkle salt on the painting. Wait for it to dry and the salt will absorb water and pigment, drawing it in so that you are left with snowflakes or stars. Here is the same salt technique again. The wetter the paper is the bigger the snowflakes will be. If the paper is very wet, you may get a snowstorm effect; however, if too wet the salt will disolve completely and you won't see any result at all. With a shiny surface you will get nice fluffy snowflakes, and if you wait until the sheen has left the paper and it is only damp, then you will get smaller snowflakes or stars. In this video, I painted the footprints of the hiker into the snow. By dabbing blue watercolour paint onto the dry paper and then bleeding it out into clear water by using a clean wet brush to sweep across the top of the paint while the blue paint is still wet, you can create the illusion of footprints in the snow. To create soft blue shadows on snow wet the paper first and then dab blue watercolour paint onto the paper (ultramarine blue in this case). I tilted my paper up so that my shadows would bleed down the page to look more like the trees they were cast from. To create the sharp edge of the white mountain tops I started with dry paper. The watercolour paint will never bleed into a dry area so you can create very crisp lines by painting on a dry surface. I painted the trees in this mountain scene 'wet on wet' which is a term to describe painting with watercolour onto already wet paper. You have to work quickly so that the paper doesn't dry before you are done. 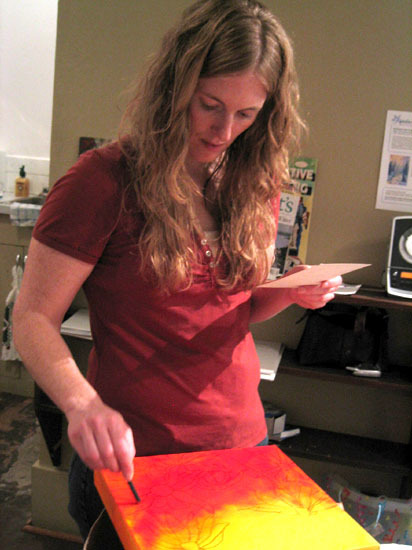 The colours will bleed into the wet paper giving very soft edges. I painted these little trees onto dry paper. I describe this technique as painting little zigzags. Start with the tip of your brush and pull down slightly to create the top of the tree and then randomly pull your brush down the paper zig zagging from side to side, increasing the span as you go. It's subtle so don't over do it. 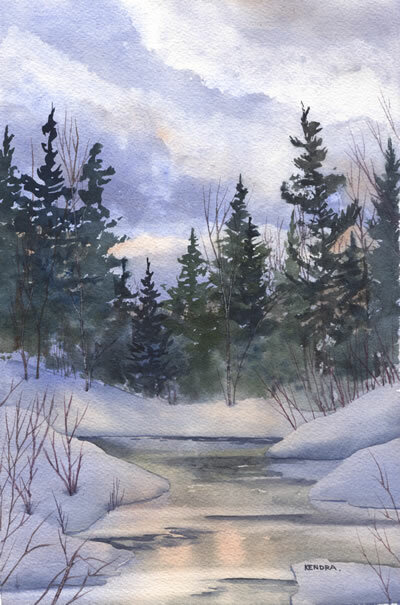 In this painting demonstration I add the shadows to the snow. A seemingly flat painting will suddlenly spring to life when you add shadows. Watch how the trees start to pop off the page once they have a shadow under them. Next I painted the lines for the snowboarders riding through the trees. I laid down their shadows first and then in silhouette painted the snowboarders on the run. In watercolour the white of the paper is the white in your painting. 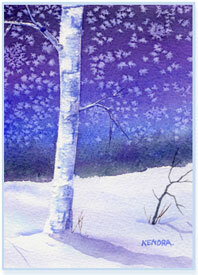 If you want to paint trees with snow then you need to plan this out ahead of time and leave the snowy areas white. Sometimes we simply do not have this forethought and when we have finished a painting we sometimes wish that we had put snow on the trees. In this case I simply used acrylic gesso to add the snow after the fact. It is easy to do and adds a nice texture to the painting. It is now a multi-media painting. This workshop is perfect for those who have dabbled in watercolour and would like to work on their technique and learn some more tricks and tips. With demonstrations and easy exercises, we will use the basic elements of composition, colour and light to help bring your watercolours to life. 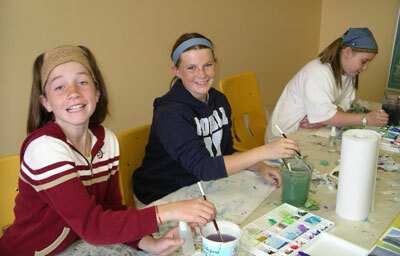 The focus of this class will be on painting dramatic skies including Northern Lights, Snow Covered Trees, and Water. We will touch on other aspects of the landscape as well. This workshop is perfect for those who have dabbled in watercolour and would like to work on their technique. With demonstrations and easy exercises, we will use the basic elements of composition, colour and light to help bring participants watercolours to life. 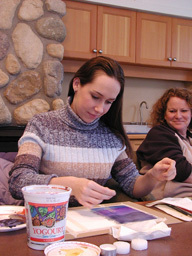 The focus of this class will be on painting water and reflections, touching on other aspects of the landscape as well. 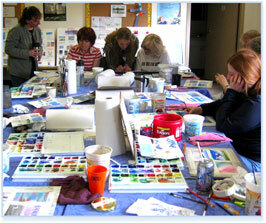 This weekend workshop is for those who have little or some experience in watercolour. With demonstrations and easy exercises we will use the basic elements of composition, colour and light to help bring your watercolours to life. 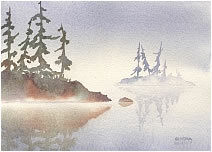 The focus of this class will be on painting water and reflections. 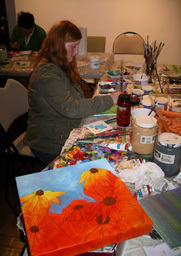 Artist Kendra Smith hosted this weekend workshop that was perfect for people who have never tried watercolour painting. Emphasis was placed on the techniques and skills needed to develop a foundation of watercolour basics. Through demonstrations, practice and individual attention, we took the intimidation out of watercolour and made painting easy and fun. Registration was full with 8 participants. 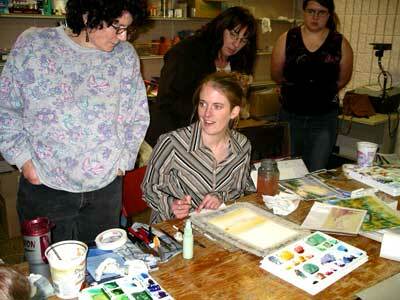 Kendra has taught watercolour workshops in Sparwood, Fernie, Elkford and Kelowna, BC. "When I am teaching watercolours, I tell my students that there is no such thing as mistakes; only techniques that may better be used somewhere else. Sometimes the unexpected can become the best part of a painting. It's important to be able to let go of control and let the paint blend into the paper as it will. You get beautiful, luminescent results when you let the paint do its thing."